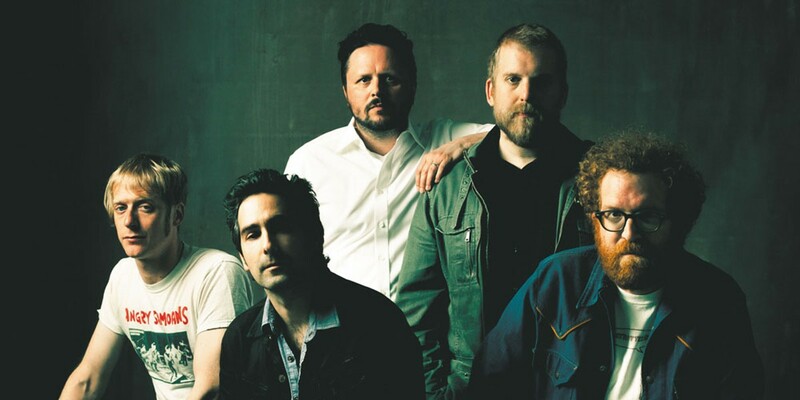 Submitted Blitzen Trapper plays Humboldt Brewery on Thursday, Aug. 4 at 9 p.m.
We all have daily struggles in our modern lives, trying to scrape by and hustle a living out of the crushing jaws of the free market. Money issues aside, it's easy to overlook the small things in life that we find meaningful and create joy. Stop and smell the roses, it has been said. The thinking is that if you can hit the metaphorical pause button for just a few moments while rushing through the day and smell a rose, you will be reminded of the immediate and beautifully overwhelming "nowness" of the present. As amazing as roses are, they are not the exclusive revealers of the now. Almost anything can connect us with whatever it is exactly I'm speaking of (dasein anyone?) and, for many of us, music can be the most accessible. I was lucky enough to be at a dear friend's wedding recently and, as we know, putting on a wedding can be stressful. My friends did a remarkable job and everything turned out great but the bride and groom were, well, exhausted during the reception. Friends and family who had been helping set up were almost as tired. Late in the evening during the dancing, the bride requested Queen's magnum opus, "Bohemian Rhapsody" be played on the P.A. system. The D.J. obliged and the room transformed. A sort of private flash mob event immediately came to life. A room full of perhaps 60 people all joined their voices together with Freddie's and danced and jumped about as if their lives depended on it for close to six minutes. Children as young as 7 and adults as old as ... well, old, were all singing wildly in joyous unison. I had never seen anything like it. The groom, a rather shy — and by this point in the evening, ragdoll-looking fellow — was fully animated and jumping around on the dancefloor as if he had gotten more than four hours sleep the nights before and had been practicing this song his whole life. The whole room was electric and strangers were smiling and thicker than thieves during this one song. I will admit to almost tearing up during all this. Call me a sappy sucker but I'll call it magical. Everyone was completely alive and being right there, right then. There are only so many noses you can shove into roses, but play a great song and everyone can sing along. The 32nd annual Reggae on the River kicks off today at French's Camp down there close to the Humboldt/Mendocino county line. Ever a favorite festival of ours here in Humboldt, let's hope you got your tickets ahead of time. Congrats to the Mateel for making this year's festival "water neutral" with a killer rain-water catchment pond. You can peruse all the performers and, I hear, can stream it online at www.reggaeontheriver.com. 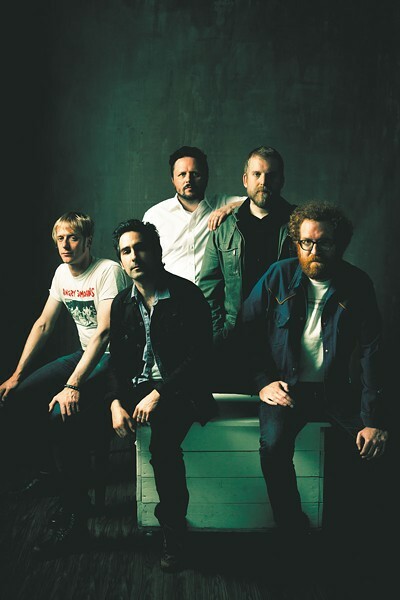 About as far away from reggae as you can get, Portland rockers Blitzen Trapper are returning to Humboldt Brews tonight. I thought they were just in town three or four months ago, but it turns out it was back in November when they stopped by Arcata (on their way to Seattle) supporting their then-new release of All Across This Land. I won't review the album again but you're welcome to go back to the Nov. 12, 2015, edition of The Setlist, should you want to hear what songwriter Eric Earley told me about writing and recording said album right after it came out. Anyway, these guys are a hardworking rock band and I kick myself for missing them last time they were in town, so I'll be making this one for sure. Local lunar dirge band Strix Vega will be opening this $15 show at 9 p.m. (Full disclosure: I'm not only going there to see BT, I'm playing.) Those of you that have been around the local indie music scene for the past two decades will most likely remember the name of former local Michelle Cable of Panache who moved out New York City way to keep booking bands on tour throughout the country. Well, she's sending a few more bands back through Humboldt and you can thank her for getting Toronto-based songwriter Michael Rault to The Miniplex tonight where he'll be peddling his "synthesis of jukebox R'n'B, and acid pysch." He's joined by Austin, Texas indie psych-poppers Tele Novella and local favorites The Monster Women, all for only $5. This show gets going around 9 p.m. It's Trinidad Arts Night tonight, so starting at 6 p.m. you can stroll around this drinking village with a fishing problem (as I've long heard it called) and soak up the scene. At the same time Ultra Secret (part of the Good Guy Organization?) will be fusion-funkin' for free at the Mad River Brewery Tasting Room in Blue Lake. Speaking of Blue Lake, 11 a.m. is the start time for the annual Buddy Brown Blues Festival happening in Perigot Park all day. There's a great lineup (too many to list here) so bring $12 and soak up the sun in the lake o' blue. The Miniplex in Arcata hosts Miss Lana Rebel who has been stopping by Humboldt for at least 11 years from what I know, and I have hazy memories of seeing a previous band of hers called The Juanita Family and Friends at some house shows way back when. I think she lived in Oregon back then, but relocated to Tucson some time ago. This queen of dustbowl country is joined by friend and collaborator Kevin Michael Mayfield and also former Oregonion Sir Rozzell — who I'm assuming is the Gabe Rozzell who moved to Humboldt years back — at 9 p.m. These three musicians for only $5, so go check 'em out. Local keyboard wizard Aber Miller tells me that Scuber Mountain has a special show at Hum Brews in Arcata tonight. Bassist Drew, who has played with too many local bands to name, has only the rest of this month in Humboldt before moving up north to Seattle and drummer John is moving south. The band isn't dissolving or disbanding, just decentralizing from what Aber tells me. But this may be your last time to check out the Scubers this year, so don't miss it. They'll take the stage around 9:30 p.m. and, again, for only a $5 cover. I'm still trying to find a time to sit down with local legend Ian of the Alibi to pick his brain about the local music scene, but while we work out our schedules he informs me a rock 'n' roll band from Australia called Miss Destiny is hitting the 'bi tonight. Expect the soundwaves to burst forth starting around 11 p.m. when Colorado Country Punkers The Drunken Cuddle takes the floor. Another $5 show tonight. We've got some out-of-towners tonight in our fair neck of the woods. Visiting us from Kentucky, singer/songwriter Jeremy Pinnell is on the road supporting his recent album entitled OH/KY, which is getting some pretty good reviews. I also read somewhere that he's actually from Cincinnati, OH and with his album named what it is I'll just assume he's from both places. Regardless, you'll find him tonight for free at 8 p.m. at Six Rivers Brewery in McKinleyville. From what I can find online, it appears that Peter Bradley Adams is originally from Birmingham, Alabama. I don't know where he considers himself from currently, but I can't think of a reason why that really matters to us tonight. He's had his songs land on some TV shows that even I have heard of, and if you couple that with the fact that his press release states his former band was signed to a record label by Robbie Robertson, Peter must have it going on. He'll be performing for $15 at Hum Brews tonight starting at 9 p.m.
Andy Powell is a congenital music lover and hosts The Night Show on KWPT 100.3 FM weeknights at 6 p.m. He may like weddings after all.